Event Solutions successfully services a variety of customers – from those in the commercial, residential, industrial, municipal, and specialized service industries, to weekend do-it-yourselfers. 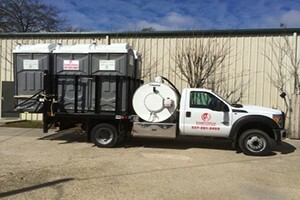 We have an unmatched selection of sanitation solutions from basic port o let rentals to dumpster rentals. Our extensive inventory includes portable restrooms, hand-wash stations, shower trailers, temporary fencing, generators, dumpsters, and more. When it comes to construction, demolition and renovations, maintaining a clean work place can reduce accidents, improve employee safety and show respect to the local community. In addition to the many products Event Solutions can offer you, our affiliate company Deep South Containers provides a complete dumpster, waste, and demolition removal for your business.